This tip was inspired by a comment we received from Elaine. Thank you! The new Gmail that began rolling out this past summer, is one update that caused a whole lot of controversy. And it’s still the update people love to hate. Unfortunately, Gmail users have no choice as the New Gmail will eventually reach all Gmail users.In fact, around 90% of all Gmail users are now using the new Gmail and have no option to go back to the old Gmail. 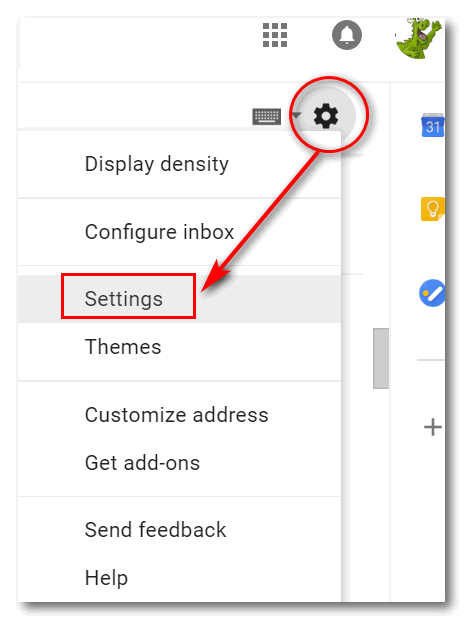 Included in the new Gmail there are several new features you may not be familiar with. Today we’re going to introduce you to Compose Assist. 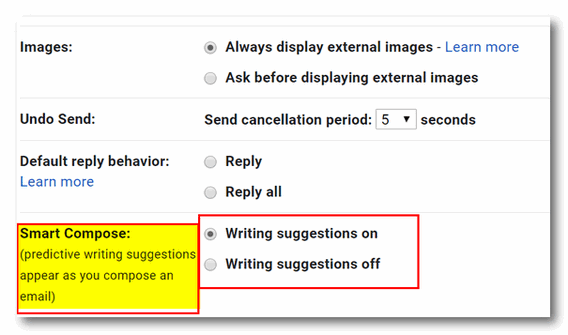 When Compose Assist is turned on, writing suggestions will appear as you’re composing an email. Compose Assist uses AI (Artificial Intelligence) to guess what you’re going to write next. This can be annoying or helpful, depending on how well it works for you and how you view it. Some people find it spooky, but it’s really not. When you think how common certain English phrases are and with millions of emails to learn from, it’s not difficult to figure out just how AI can guess what you’re going to write next. It’s largely about context. The image below, courtesy of Google, shows you how Compose Assist works. Compose Assist will try to guess what you’re going to type next, and if guesses right, then all you have to do it tap the Tab key on your keyboard to have the text included in your email. 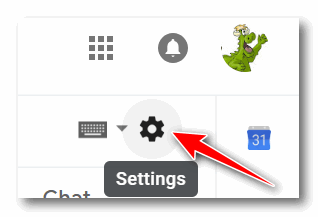 Open Gmail and look for the gear icon (Settings) near the top right the Gmail window. In the menu that appears when you click the gear icon, click on Settings. Tick the radio button next to your choice – Writing suggestions on or off. We find Smart Compose very handy, but we understand why many people would find it annoying. And now that you know how, YOU can take control of Gmail’s Smart Compose. Do you like it? Or not? I really do like it, it makes doing a quick reply much quicker and easier. Smart compose….not so smart. Very annoying. Glad I could turn the darn thing off. I like this feature when using my phone, because of having to type one finger at a time. But when I’m typing anything on the computer, I’m a touch typist using all my fingers so it’s in my way. It’s an annoyance. Thanks for letting me know how to turn it off! I first ran into this on my iPad. I found it very aggravating and turned it off. It looks like gmail’s is planned better. Glad we can turn it off. I’ll try it first. When this first began I wondered if it was worthwhile but have decided I quite like it. I am not a speedy typist (TC, you will be well aware of this from patiently awaiting my replies when you are helping on my pc 😉 ) so if what is suggested is not what I planned I just continue on my slow way. A great program for the millions of people who can not compose ‘letter’ or create a correct structure of sentences or phrases in a letter. “Never end a sentence with a preposition” was drummed into us at Grammar school by Dr Bruckshaw the teacher, a Doctor of English. Currently we are now being told, “It’s OK to end a sentence with a preposition if sending e’mail or text messages to a friend, but not acceptable in a formal letter or e’mail. In today’s declining standard of education in Australia, one method of ending a sentence is OK, the formal method of ending a sentence is not OK.
Should it not be so that the correct use of the English Language be taught in education situations and should be adhered to, not a variation which does not follow the rules and indicates a level of illiteracy by those who sidetrack the one and only correct method of writing, irrespective of the informal or formal comment, sentence or complete written, typed, or printed communication. At first I thought it was creepy and that someone was reading my email, and my mind. But now Ive become accustomed to it and like it. It does save some typing! Andi – we are having trouble getting in touch with you – your email server is rejecting all our mail. Please contact us.